I started reading Confederacy of Dunces on the train this morning. It is so, so good and so, so funny. I am bummed I didn’t know about this book earlier. From the moment he spilled his apple juice on his pants on 7:30 from JFK to Tel Aviv, cruisng over Munich, Michael Shtulman knew he would die airborne. He always looked for omens to tell him where his day was headed. If the waitress took too long to bring the check, it meant the day was ruined. If he forgot to fill up the car on his way to work, he might be stuck in traffic, or more likely, die in a gruesome car accident that would get only a passing mention on the local Fox News affiliate. If a black cat crossed his path it meant his unborn and unconcieved daughter would only get into a safety school instead of the Ivy League she was created for, and next thing you know she’s a stripper and his parents are rending their clothes yelling at him in his bedroom (in his head his parents always yelled at him in his bedroom) “What have you done to our granddaughter?.” These were the kinds of things Michael Shtulman worried about on a regular basis. So, the apple juice was a bad sign. Obviously, my beginning is pretty terrible since it’s just a rough draft, but the main thing is that both protagonists are schmucks, a type of character that is growing in the West, both in novels and real life. I wrote my novel based on some of the Russian guys I know or have heard of in the Russian community: in their early 30s, unmarried, still living at home, helpless in America, the country their parents struggled so hard to bring them into. But a schmuck doesn’t have to be a specific nationality, just a man who’s forgotten how to do stuff men are supposed to do: fix stuff, protect stuff, and make a good living for his family. In fact, we don’t have to look far to find them: they’re all over Judd Apatow’s movies. But their whole premise is that they reward the man who has regressed into infantility. Why? Because men aren’t forced to do the stuff they did before anymore: fix stuff, take stuff apart, kill things for meat, and so on, and in doing so, in sitting at the computer 8 hours a day for white-collar jobs, I think men have lost something of being men. 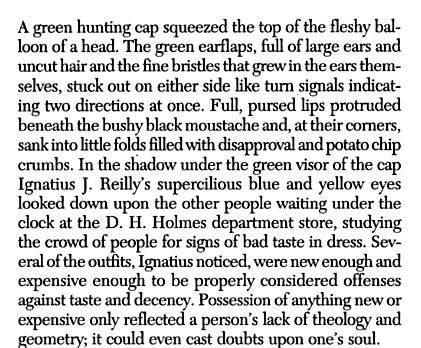 And I really wanted to explore this phenomenon, of the helpless man, in my novel, and now that I realized Dunces has already said everything there is to say on the topic, I don’t have to edit it anymore! Piece of cake. I think the phenomenon is greatly elevated in immigrant cultures, where guys are babied more and girls are expected to have their stuff together. I have no links for this. Just a hunch I have on years of being raised as a chick in a Russian-speaking community. Could you argue that the fact that I think an increasing amount of men are schmucks as a result of the post-industrial age is sexist? 100%. You could say that, since women don’t work in the home as a majority anymore, we’ve lost something of being feminine. Of wearing dresses and corsets and ironing and making stuff from scratch. You could say that my view is tinted by nostalgia. Except, even though we work, we’ve picked up both work AND after-work work. Mr. B and I have a fairly egalitarian marriage and try to mix up gender roles as much as possible. I mow the grass and Mr. B folds laundry. But I still do most of the cooking and about 65% of the cleaning and oversee the rest. We tried this thing where he would prep stuff for me in the kitchen i.e. peel potatoes, boil pasta, chop vegetables, etc, and I would do the rest of the recipe, but that came to an end when I got tired of telling him just how to do stuff and found it was easier to do it myself. Sometimes Mr. B comes home before me. Ideally, he’d at least have the ingredients out. But only I know what ingredients we actually have in the house, and whether we can make pasta or couscous or salmon or pizza that night. Mr. B is the smartest person I know, and always more than willing to help. But the more I’m married, the more I realize there is something to that “woman’s touch” analogy, that we make stuff come together at home that men can’t, and I can’t put my finger on why. The fact that this stock photo exists is why I love the internet. But I digress. Back to the schmucks. They exist because in America, if you don’t want to grow up and you grew up in a middle class household, you don’t have to. As long as you work, pay the bills, do whatever, you can lounge around well into your mid-30s or even early 40s. You don’t have a biological clock that’s ticking, no bear is threatening your homestead, and no gender norms are forcing you to make money while your wife is segregated at home. That’s why I find Confederacy so interesting: it predicted the rise of the dudebrahs by at least 40 years, and I can’t wait to finish it.